If you use a Windows powered mobile computer (Notebook, Tablet PC etc) and have to switch between different network settings everyday (such as changing the IP addresses while at office and rolling back the changes once at home for instance) because your networks don’t allow automatic IP obtaining, then “Simple IP Config” utility will come in handy. It’s a small, free & an open source tool that lets you manage different network profiles with ease. 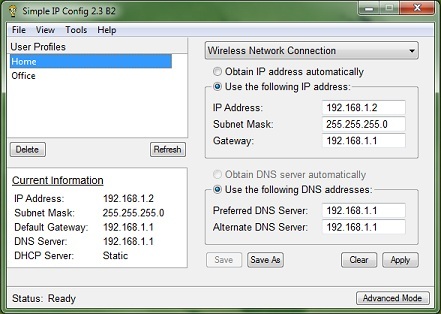 You can adjust IP settings per profile (IP address, Subnet Mask, Gateway etc) and save them. Then whenever you want to switch to a different profile, select it’s name and click on the “Apply” button, and all those settings will be applied within seconds to your preferred network device. *. Automatically detects all of your network hardware. And the latest version (still at Beta, but worked quite fine while I was using it) automatically detects the active device. *. You can enter an IP address, Subnet Mask, Gateway and the DNS addresses. *. Whenever you select a profile, it shows its above mentioned details. *. 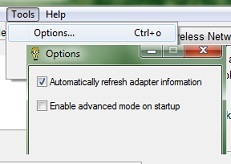 Disable selected adapters and the Windows’ built in Firewall (hidden by default). *. Close to system tray. When you switch to a new profile, it outputs the current progress in the bottom status-bar (whether it’s applying the setting or have finished done so etc). Now, I don’t know if its because I used the latest Beta version, even after completed changing the IP settings, it still displayed “Apply Settings …” in the status-bar, which is obviously misleading. But you can easily fix it. For that, first from its menu go to: “Tools” -> “Options …” and from the next window that you get, make sure to put a check mark under “Automatically refresh adapter information” option and then click on the “Save” button. That’s it!. After that, whenever you make a change, the status-bar will update the details accordingly. But it would’ve been better if this option was enabled by default rather than having to manually enable it. Other than that, it worked really well. If interested, you can get it from this “Simple IP Config” project page.